Yes, it's that time of year again. The time to bask in the glittering glow of all the latest and greatest premium tech products at the Luxury Technology show. 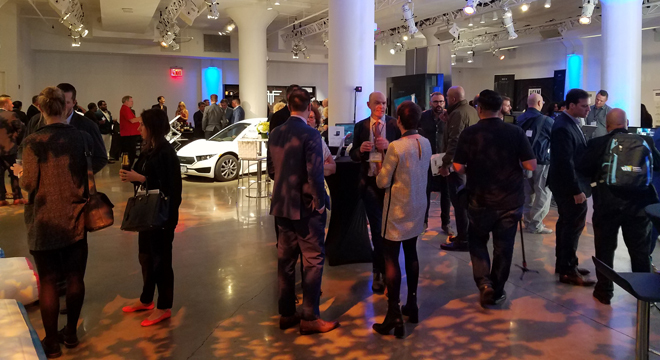 Held at Metropolitan West in New York City earlier this week, the Fall 2017 event spotlighted several new high-end electronics, gadgets, and other expensive toys from a variety of brands, showcasing all of the latest innovations in indulgent tech, ranging from high-end speaker systems and headphones to decidedly stranger items like smart mirrors, smart showers, and... smart toilets. Thankfully, our focus here remains on home theater gear and not bathroom appliances or other distractions. With that said, no Luxury Tech Show could be complete without a brand new car! 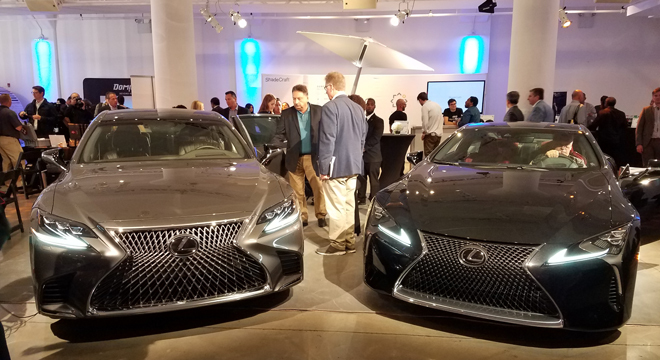 And since one is clearly just not luxurious enough anymore, Lexus decided to bring two to the show. With the requisite fancy $75,000 car now out of the way, it's time to move on to the top AV products and brands from the show, highlighting some great new audio gear, including some models with surprisingly affordable price tags. 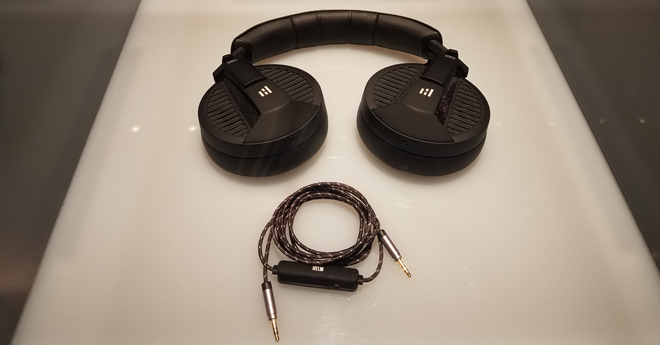 Formerly known as Tidal Force, the newly christened Helm Audio brought its lineup of Planar Magnetic headphones to the show. Serving as a kind of mix between standard dynamic drivers and electrostatic drivers, the company's implementation of Planar Magnetic technology uses a diaphragm layered with micro conductors to interact with an array of magnetics, creating even, balanced vibrations. The products on display at the show included the current Wave 5 model ($299), along with the upcoming larger Wave 10 headphones and in-ear Wave 2 headphones. The Wave 5 headphones feature an open-backed design with 56 mm Planar Diaphragms, an all metal construction, and extreme comfort ear pads. 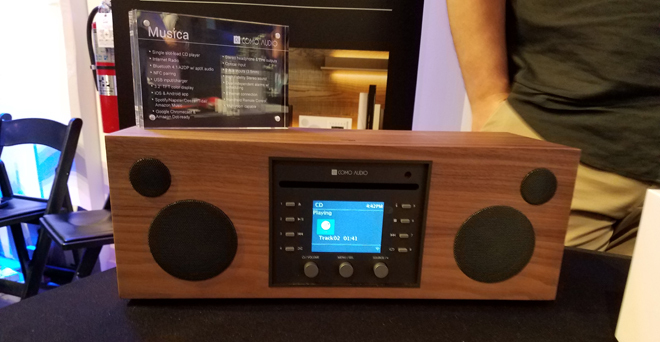 While I already got to take a listen to this particular model at the previous Spring 2017 Luxury Tech Show, for this demo the company offered something a little more unique. Instead of playing back a standard pre-recorded song, Helm Audio's own CEO, Grammy Award Winning Producer Mike Dean, was on hand to play a live keyboard synth track fed into the headphones. Marked by escalating tones and beats, and a cool electronic quality to the sound, the instrumental piece came through with spacious depth, making it easy to forget that I was in a noisy tradeshow environment. Of course, I'd need more quality time with the headphones in a quiet setting to really make a firm judgement, but I once again came away impressed by the Wave 5's performance. Sadly, the new Wave 10 and Wave 2 models were only on hand for display purposes, but both models are due for release in January. The Wave 10 headphones ($499) are poised to serve as a big brother model to the Wave 5s, offering larger 100 mm Planar Magnetic Drivers along with rotating ear cups, connection options for either channel, and a durable metal design, making them ideal for DJs, sound designers, and serious audiophiles. Meanwhile, the Wave 2 is set to become the world's smallest planar in-ear headphone on the market. Units will be available in both wired and Bluetooth-ready wireless versions. With its premium Viotti One Loudspeakers and Tozzi One Single-Driver Bookshelf Loudspeakers on hand, MarkAudio-SOTA also made a notable impression at the show. The Viotti One is the company's beautiful flagship two-way stand-mount loudspeaker model with one 50mm (2") low mass mixed alloy symmetrical sound field cone unit, and one 110mm (4.4") low mass, long throw mix allow symmetrical sound field cone unit, delivering a range of 40Hz-25Khz. Though HDD has already had the opportunity to review the Viottie One speakers in depth (check out Michael Palmer's review here), this was my first time getting to hear them. Of course, as I must mention about nearly every tradeshow demo I attend, the room was not ideal for critical listening (there was some pretty distracting bass booming from a separate booth nearby), but considering the loud setting, the speakers filled the space quite admirably. 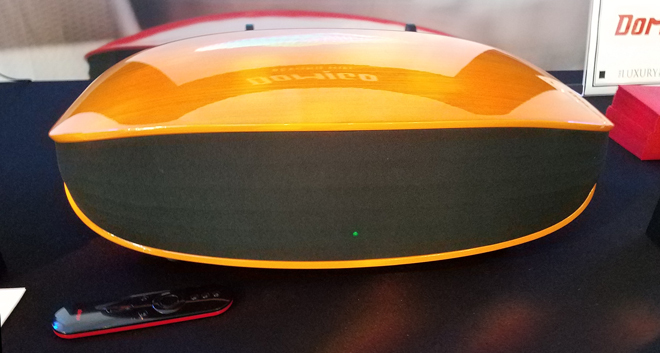 For the demonstration, I listened to singer Eva Cassidy's rendition of "Fields of Gold" playing from a CD connected to the speakers via a compact PS Audio Sprout Amp ($499). Despite the environment, the vocals came through with a pleasingly full yet intimate presence. The Viotti One loudspeakers are available now for $2,495 per pair with matching stands. Meanwhile, though I didn't get a chance to hear the Tozzi One Single-Driver Loudspeakers, they offer a much more compact and affordable option for smaller spaces and more casual lifestyle applications at just $445 per pair. The speakers feature an advanced 50mm Sota 5 all-range driver, a rigid composite enclosure constructed from 3 sub-structures, and a waveguide front baffle. Hoping to demonstrate its "Beyond Hifi" philosophy in full force, Domigo Acoustics brought its upcoming debut lineup of speakers to the show. The collection includes the A9 Smart Home Theater Speaker and the A7 Minimalist Wireless Speaker, developed in partnership with world-renowned Danish acoustic engineer Peter Larsen. Designed to be used with music or as a sound bar for movie watching, the A9 features a bold, modern design with four integrated speakers, wireless connectivity, and support for DSD hi-res playback. Likewise, the unit includes an HDMI out and doubles as an integrated Android TV solution with 4K support (but no current plans for HDR), allowing users to connect the speaker to their displays in order to access various streaming apps directly from the A9's built-in smart TV platform. Likewise, though not yet finalized, the company is working to include some kind of support for Dolby Atmos to offer simulated immersive audio (there are no actual upward firing drivers). For demo purposes, I navigated through the pre-retail unit's preliminary open Android UI and selected a few movie trailers, including Wonder Woman and Thor: Ragnarok. The A9 brought some solid heft to the room and robust low-end for its size, filling the noisy space quite well with fairly dynamic sound. It's too early to tell how well the app integration will end up working, but the Smart Sound Bar concept has a lot of potential. Meanwhile, the A9's smaller sibling, the A7 features two integrated speakers and Bluetooth wireless support but ditches the integrated smart TV solution. During the show I got to listen to a Pearl Jam track via TIDAL, first over Bluetooth, and then over a wired connection. The Bluetooth playback was pretty solid but a had flatter quality compared to the wired playback which resulted in a cleaner, fuller sound. Again, it's hard to really form a full opinion on the audio quality based on how loud the room was, but both the A7 and A9 look like products to watch out for as they prep for launch next year. Bringing multi-room audio support to the party, Como Audio had its lineup of Hi-Fi systems on display with support for connecting up to 5 units together around the home. The product collection included the Solo ($299), Duetto ($399), Amico ($399), and Musica ($599). The Solo features a nearly half inch-thick MDF wood case with TFT color display, a .75 inch soft dome tweeter and custom 3 inch long-throw, 4-layer voice coil woofer with oversized magnet. Likewise, the device uses a custom digital signal processor, 30 watts per channel RMS digital amplifier, and offers support for FM radio, internet radio, Bluetooth streaming, Wi-Fi connectivity, and even an optical port for connecting to a TV. For demo purposes, I listened to a music track through Spotify, and though the speaker sounded a tad boomy pumped up to compete with the loud room its audio output was pretty solid considering its tiny size and the conditions. Meanwhile, the Duetto model steps things up with two .75 inch soft dome tweeters, two custom 3 inch long-throw, 4- layer voice coil woofers with oversized magnets, and a custom Digital Signal Processor (DSP), 60 watt RMS Class D digital amplifier. Likewise, the upcoming Musica model even adds integrated support for Tidal, Deezer, Napster, and Amazon Music (to be added in the Fall of 2017), along with a built-in CD player with the ability to stream CDs to other Como Audio devices. Lastly, the Amico offers many of the same features as the Solo but in a battery-powered, portable form. Finally, one of the more unique products I demoed at the show was Nuheara's IQbuds ($299). More than just your run-of-the-mill wireless earbuds with noise cancelation, the IQbuds also offer advanced speech amplification and augmented hearing capabilities. This allows users to choose exactly how much ambient sound to cancel out when listening to music, along with the ability to specifically isolate speech around them while still blocking out other unwanted noises. With that in mind, this is perhaps the very first time I can confidently say that the noisy show room atmosphere was actually the ideal setting to test out the device! With the IQbuds firmly placed in each ear I listened to my surroundings with the "Restaurant Mode" activated. This setting notably dulled out the loud commotion of the show while amplifying speech around me. Sure, people's voices now had a noticeable electronic tinge to them, but I could definitely hear people near me a lot better. Standard Bluetooth playback for music was pretty solid too, and I could even keep the speech amplification on while listening to tracks, allowing me to hear the music and people around me while still canceling out much of the loud background noise. Serving as a rather unique cross between wireless earbud and hearing aid tool, the IQbud has a lot of practical applications, making it an ideal fit for users who want a little more control over what sounds they have to endure on a daily basis. I'm not sure how well it holds up over longer use and in other settings, but my brief time with the device has certainly left me intrigued. So, there you have it. Those were some of the top products on hand at the Fall 2017 Luxury Tech Show. What do you think about the show's luxurious gear? Will you be saving up for any of the items on display? Let us know your thoughts in the forum!